In 1965 a pair of researchers, Robert Rosenthal and Lenore Jacobson, set out to study the Pygmalion Effect, which hypothesizes that if we hold high expectations for people’s performance, their performance will be better than if we hold low expectations. What they found was startling, especially for younger kids. 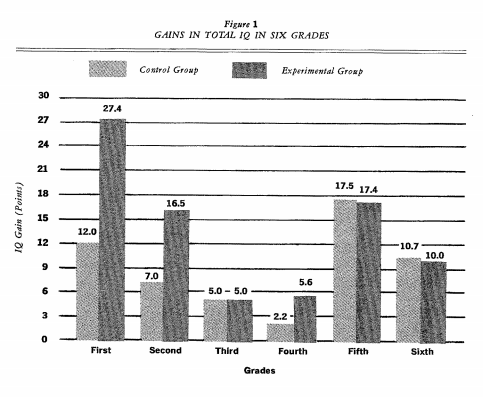 Students who had been randomly selected as being likely to show potential based on an imaginary test and then this information communicated to their teachers, showed tremendous gains in the intellectual ability compared to the control group. The reverse effect, called the Golem Effect, has also found to have an impact through randomized-control-sample experimental design. This means that one factor into student performance is the expectations teachers have, either high or low, on that student performance. This is why I get incredibly frustrated when teachers use labels like “high” or “low” to describe their students. Invariably these labels are like self-fulfilling prophesies that lead to strengthening or weakening student beliefs about their own ability to be successful and lead to teachers, subconsciously, taking actions that lead to either higher or lower student performance, and as performance is related to student learning, this can be devastating. Of course, this pernicious labeling of students is built right into our systems of education so we can hardly consider individual teachers to be at fault. We have the ELL students, the SpEd students, the “lower third”, the students who only achieved a 1 or a 2 on the NY state exam, the students who failed algebra last semester, and other unhelpful labels for students ad nauseam. So what do we do? I propose a good starting place is to eliminate unhelpful labels from our own vocabulary. Another step is to talk to our colleagues about our shared use of labels for students. Find ways to look for and talk about strengths in students rather than perceived deficits.